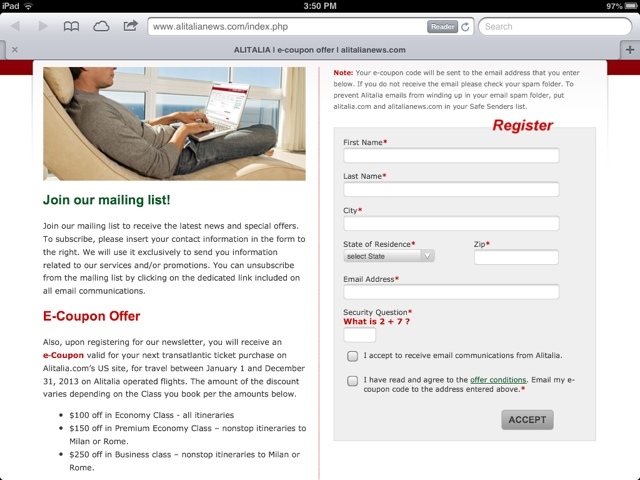 Upon registering for our newsletter, you will receive an e‑Coupon valid for your next transatlantic ticket purchase on Alitalia.com’s US site, for travel between January 1 and December 31, 2013 on Alitalia operated flights. The amount of the discount varies depending on the Class you book per the amounts below. $150 off in Premium Economy Class – nonstop itineraries to Milan or Rome. $250 off in Business class – nonstop itineraries to Milan or Rome.